30 huts including a few for family of 4 in two twin/double cottages. To make holiday comfortable without disturbance, television, telephone, newspaper and air-conditioning have been kept out. Sailing, boating, deep sea fishing, snorkelling, Scuba diving. 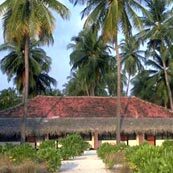 Entry Permit : All visitors to Lakshadweep Islands will require an entry permit. Advance information like Name, address, place and date of birth, passport number, date and place of issue and expiry will be required.